There's a new place in town called Surfin' Ribs which apparently just opened recently. Went there with a few close friends and decided to try the place out. The place looked like an unfinished puzzle given the bricked wall not finished. It adds a little distraught feel to it. They had their soft opening last March 10 and yes we had to drop by to have a taste. 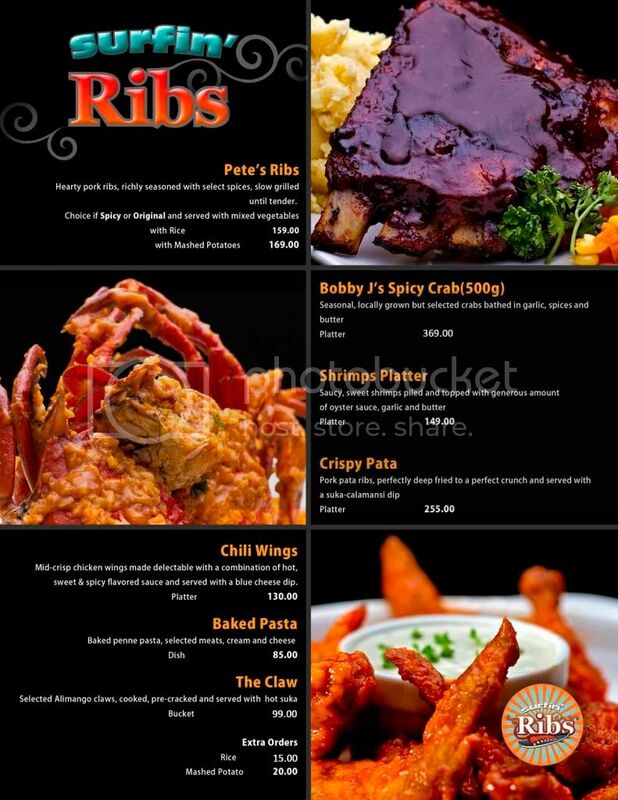 The reason why we decided to come over is the menu that offers the comfort foods we all love: baby back ribs, spicy wings, crabs, shrimps and yes pasta! Everything you wanted all in one laminated menu. I'd also like to note how cheap the selections are aside from the seafood which is completely understandable due to its availability. It is located at what used to be a branch of Flame It, beside the Aviary Branch in Escario just a few distance from Philhealth Cebu. The place is wide open, they have eight tables which can hold up to 6 guests each. They have a clean sink for hand washing and a very decent comfort room. The waitstaff were really friendly and was rather attentive. We were handed with the menu and we know we came here for our protein fill. Let's have a moment of silence as we go over the photos. Passable mashed potato and crunchy veggies. The meat was oh so tender. There was a huge contrast of fat and meat the best one there is. One can never finish the whole slab without getting all messy. You just have to dig in! Eat like you mean it! We finished off the meal with a few sips of our chosen beverages. The place is a no fuss, no hassle area to dine in with friends and have a smoke, laugh and a bucket of beer! By the way, I failed to take a photo of the bucket already fastened on the table. Good for happy hour with friends and colleagues. We would definitely come back for the seafood. I know I would. Also, I'd like to point out that we only got to spend Php607 for everything! It is definitely a steal and truly worth every cent! Had we dined somewhere else the amount we paid was only good for two! Definitely a great place to chill and have your protein loading! Worst service I ever had. Waited for over an hour for the food to be on our table.tsktsk.. I told the service crew that orders need to be in FIFO (first in - first out basis).. service crew said that our order came along with the Crispy Pata that's why it took so long to serve. So guys, don't order them together with the ribs. 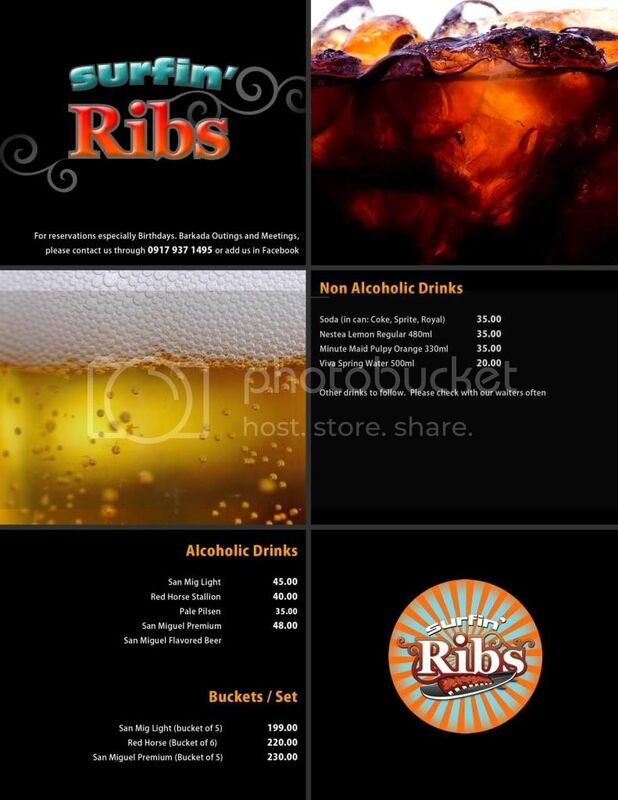 If your hungry, then just order the rib plate (suggestion). More to that, their Crispy Pata isn't good. Hard as a rock. Customers who have waited for so long (to be seated) had their orders came in first than us. We waited an hour! The place is too small, when you get there, you have to wait till other customers are done eating. They have reserved tables, even if the customer who made the reservation arrived for so long, they wouldn't offer you the table. And lastly, the owner of this restaurant came in, & didn't even manage to supervise, but was only concern of his visitors (not customers).